Nemegtosaurus was a plant-eater (herbivore) that lived in Mongolia during late Cretaceous period between about 72 and 68 million years ago. Nemegtosaurus is believed to have been upto 43 feet (12 meters) long. Nemegtosaurus is named for the Nemegt basin in the Gobi desert of Mongolia where the first fossils of the animal were found. Asian Dinosaurs - Nemegtosaurus lived in Mongolia. Nemegtosaurus was a genus of dinosaur. "Nemegtosaurus" means "Nemegt lizard" (after the Nemegt Basin in Mongolia). Nemegtosaurus was a member of the Saurischia ("lizard-hipped") order of dinosaurs. What this means, is that although Nemegtosaurus was not closely related to lizards, it did have similarly shaped pelvic bones. Nemegtosaurus was a Sauropod - a member of a group of related large quadrupedal herbivorous (plant-eating) dinosaur with long necks. Nemegtosaurus lived between about 72 million years ago and 68 million years ago, during the late Cretaceous period. Nemegtosaurus was a herbivore (plant-eater). 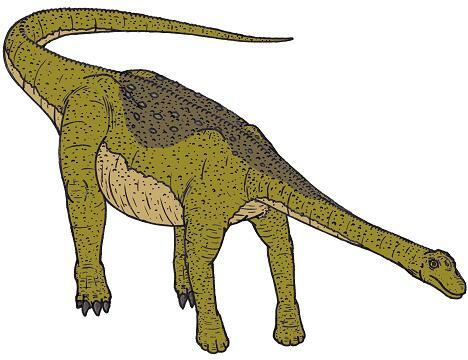 Nemegtosaurus was upto 43 feet (12 meters) long. Nemegtosaurus weighed about 20 tons.